Good morning Kitchen Fam! How's everyone doing this bright and sunny Monday morning? So far so good here in the Mid Ohio Valley, and I'm ready to share with you what I've been cooking up in my kitchen! I'm actually really excited about today's post because I'm kind of obsessed with sheet pan meals. They're just so darn easy and the food is always good! 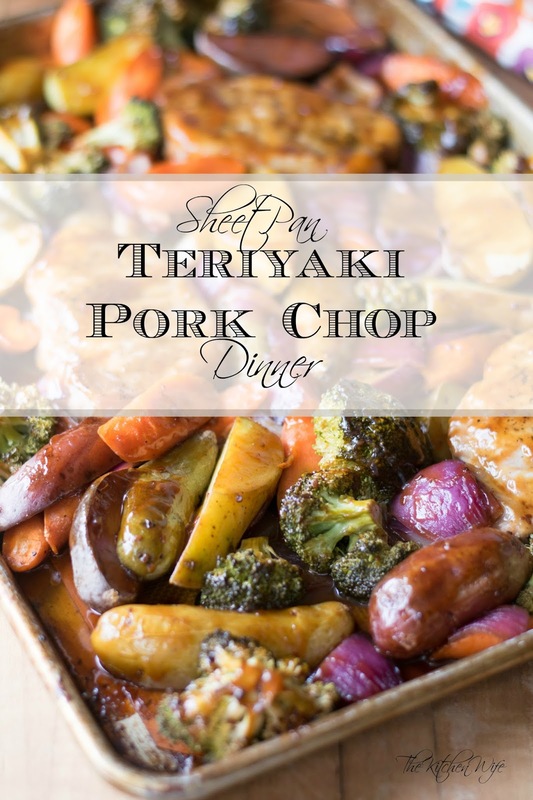 Today's recipe for my Sheet pan Teriyaki Pork Chop Dinner is no exception, although I kinda feel bad even calling it a recipe because, well, you'll see. It's no secret that we love Asian food here in Kitchen Wife HQ. Not only do I adore the flavors, but Asian cooking is always super quick and easy. One thing I'm not the biggest fan of though is pork. Studhubs loves the stuff, so when I was coming up with this recipe I wanted to use something that he would enjoy and would also compliment the pork to make it more palatable for me. So I pulled out my trusty cheat sheet book, The Flavor Bible, and started looking at all the things that work well with pork flavor wise. I see, salt, honey, ginger, etc and I immediately think TERIYAKI! I LOVE TERIYAKI, so I knew this was going to be a match made in Heaven! To begin this Sheet Pan Teriyaki Pork Chop Meal you're going to need a few simple ingredients. 1 Center-Cut Boneless Loin Chop per person you are feeding. The first step in this amazing sheet pan meal is taking the pork chops out of the fridge, seasoning them with salt and pepper on both sides, and letting them come to room temperature. After that you will need to preheat the oven to 425 degrees and prep your vegetables. Now place the veggies, in a single layer, on a foil lined sheet pan. After that you will nestle the pork chops throughout. One thing I want point out is that if you're a larger family, you will want to spread this out over two sheet pans to make sure everything cooks evenly. I piled too much onto this pan and it definitely affected the cooking time. So here is where I am keeping things real for you. I could TOTALLY make my own teriyaki sauce. In fact, if you want to know how I do, check out my Baked Teriyaki Chicken Recipe, but sometimes you don't want to mess with the dishes or the time and there is NOTHING wrong with using the stuff in a jar. Don't let anyone tell you any different! The Kitchen Wife Says So! And hey, this is a sheet pan meal, IT'S SUPPOSED TO BE EASY! All you have to do is pour half of the teriyaki sauce into a small bowl and brush everything liberally. Next, place the sheet pan into the oven and bake for 30 minutes. Once the 30 minutes are up, you will need to take the sheet pan from the oven, toss the veggies, and flip the pork chops. Then pour the other half of the teriyaki sauce into the bowl and brush everything once again. Return the sheet pan to the oven and cook for another 15 to 30 minutes. Usually it's only 15 minutes, but because I overloaded the pan it took a little longer. And this is what it will look like after your Sheet Pan Teriyaki Pork Chop Dinner Recipe is finished. I have to confess, I think sheet pan meals are so pretty. Look at all of those beautiful textures and colors on the pan. Its like art. 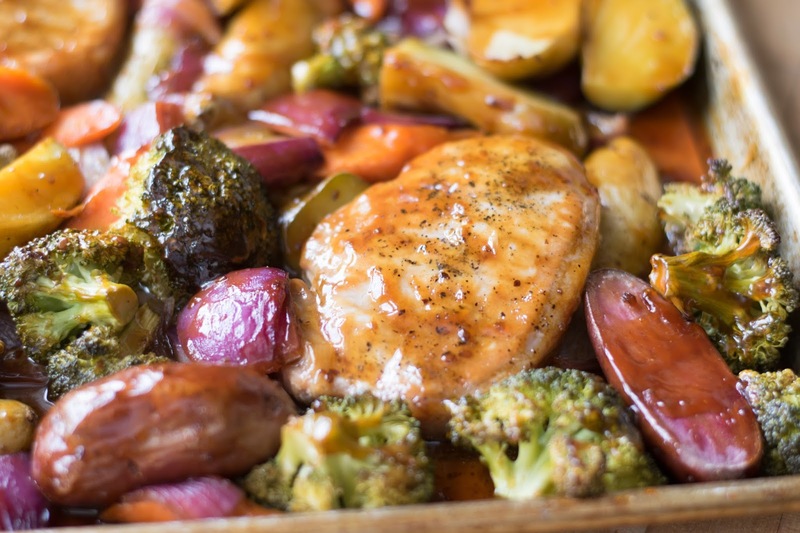 So see, you CAN have a lovely roast dinner on the table in no time with minimal effort and this Sheet Pan Teriyaki Pork Chop Dinner is the perfect example of how. The best part is you can totally play with any jarred sauce you want. Mix it up! Oh and did I mention Studhubs DEVOURED this meal and WENT IN FOR SECONDS, vegetables and all!!! Yes, my meat and potatoes husband went in for more veggies. It made my heart proud. I guess I should also mention that I served this with a side of cauliflower rice and it was delicious! I hope you were inspired by this recipe and I would love to hear what some of YOUR favorite sheet pan recipes are because the obsession is REAL! So leave them in the comments below. Season the pork chops on both sides with salt and pepper and sit aside to allow them to come to room temperature. Nestle the pork chops into the vegetables on the sheet pan. Pour HALF of the teriyaki sauce into a small bowl and brush everything LIBERALLY with the sauce. Place into the preheated oven and cook for 30 minutes. After 30 minutes flip the pork chops and stir the vegetables around. Pour the rest of the teriyaki sauce into the bowl and brush everything, once again, with the sauce. Return to the oven for another 15 to 30 minutes until the vegetables are tender and fully cooked. Serve with a side of rice and ENJOY! *If you are cooking for a larger family you will want to spread this out over two sheet pans. This will ensure everything will cook evenly.